Hand-weave a beautiful bracelet in a traditional basket-weaving style. 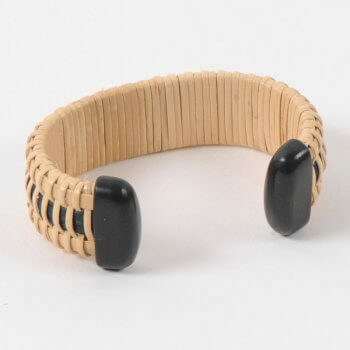 No piece of jewelry better represents Nantucket than the Nantucket Basket Bracelet. Students will hand-weave a bracelet in traditional Nantucket Lightship-style basket weaving with reed and cane and complete with your choice of end caps. A variety of metal form sizes will be available to create a custom-fit bracelet. Information will be given to students who choose to have their ivory end caps scrimshawed outside of class. Martha Polachi learned the art of basket weaving in the 1980’s from Martha Lawrence and made her first Nantucket Lightship basket in 1999. She has woven various household items over the years including clocks, ice buckets, candy dishes, wine coasters, and bread baskets, as well as traditional and contemporary Nantucket Lightship basket purses, many inlaid with ivory scrimshaw or embellished with ivory carvings. On display at the 2014 Nantucket Lightship Basket Museum exhibit, Martha’s unique umbrella stand integrated traditional and box weave patterns, which highlights the creative aspects of Nantucket basket making that she has learned over the years. Martha has been weaving Nantucket style bracelets for over three years, and they are available at Craftmasters of Nantucket and custom order by commission.